Place washed potatoes into a pot with cold water, season with salt so it tastes “salty like the sea” and bring water to a boil on high heat. Cook potatoes until they are easily pierced with the tip of a knife, about 15 minutes. Drain and rinse under cool water. 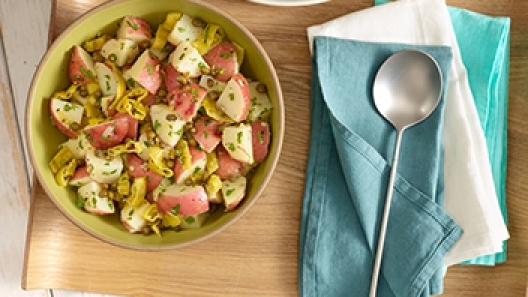 Cut potatoes into bite size pieces and place into a medium sized mixing bowl. Add the peperoncini, capers, zest and parsley. Drizzle on the olive oil and gently toss to combine. Add a tablespoon or two of the peperoncini brine for some added “zing”. Season with salt and pepper to taste and serve.